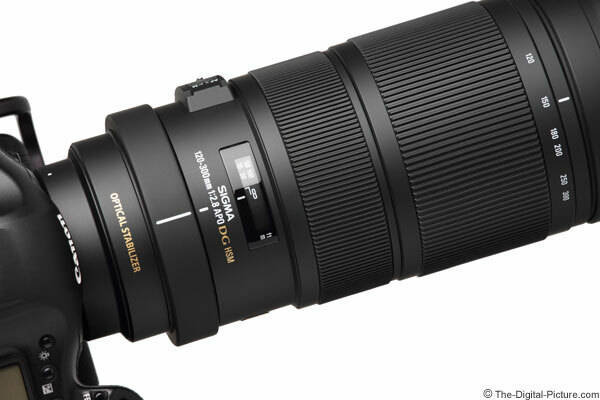 Note: The Sigma 120-300mm f/2.8 EX DG OS HSM Lens has been replaced by the Sigma 120-300mm f/2.8 DG OS HSM Sports Lens. The Sigma 120-300mm f/2.8 EX DG OS HSM Lens has the unique feature set of a zoom focal length range that extends beyond (well beyond) 200mm combined with a wide f/2.8 max aperture over that entire range. Add OS, HSM AF and great build quality to complete the package. I usually have a new lens run through my standardized testing procedures before using it for a real world application of any importance, but ... the Sigma 120-300 OS arrived just before I was going out the door to shoot a track and field meet. I had been shooting these meets with only the Canon EF 400mm f/2.8 L IS II USM Lens, but ... I couldn't resist taking this lens instead. An f/2.8 max aperture combined with telephoto focal lengths begs to be used for sports and other low light action. The zoom range adds a great dimension the 300 or 400mm fixed lenses do not have available to them. In-camera reviewing during the meet showed that the 120-300 OS was performing quite well and I was taking advantage of the hand-holdableness of the lens to capture some different perspectives. The meet ended and I was packing up when one a member of the girls' team asked if I would take a picture of "us" with their coach. The local girls had just won the meet - against a team that went undefeated for 147 meets. The opposing team had not lost a meet for nearly 18 years - before any of the current team members had been born. I understood the importance of this win to them, said "Sure" and got the camera back out. My initial understanding of "us" was a small group of girls (friends). As I walked toward where their coach was, I realized that an entire track and field team photo was being arranged for. On the track right in front of the grandstands. I stood on the absolute top seat in the stands and, at 120mm, after having the team move closer together, was able to get everyone in the frame. If I had only the 400mm lens with me on this day, the team would have had to be on the other side of the track to fit in the frame - and there would have been no hope for anyone hearing my instructions. Basically, if I didn't pick the Sigma 120-300mm f/2.8 EX DG OS HSM Lens to shoot with on that day, there would have been no team photo better than from my smart phone to capture the historic event as a team. Or, I would have had one nasty 400mm panorama to stitch together. The sun had set by the time the team photo was being shot. This eliminated any harsh shadows to contend with, but made the handheld exposure more challenging. Fortunately, I was able to take advantage of the Sigma 120-300's OS to keep my ISO settings low and obtain a sharp handheld image. I kept the shutter speed just fast enough to stop the excited subjects' motion. If you want an f/2.8 zoom lens with a focal length longer than 200mm, the Sigma 120-300 OS is the only option available at review time - without stepping up to the enormously large and enormously expensive green giant Sigma 200-500mm f/2.8 EX DG IF Power Zoom Lens of course. Second and third lenses can of course be carried, but if fast lens changes are needed, a second and/or third body must also be carried. Note that while the zoom range is definitely a big advantage, getting full use of this added benefit requires another level of skill when shooting fast action. Not only do you need to track the subject with the proper focus point(s) locked onto the subject and the camera level as with a fixed focal length/prime lens, but you also must concern yourself with rotating the zoom ring at the same time. This is no different from any other zoom lens, but many of us are using long primes for sports action. Click on the image below to see a focal length and aperture comparison created using the 120-300mm EX OS and a full frame Canon EOS 5D Mark III DSLR. Long focal length f/2.8 lenses can create a great background blur and great separation of the subject from that background. The daisy examples shown in the comparison were taken at a near-minimum focus distance. As I mentioned, the wide-as-it-gets-in-a-zoom-lens f/2.8 aperture begs to stop action - especially in low light. 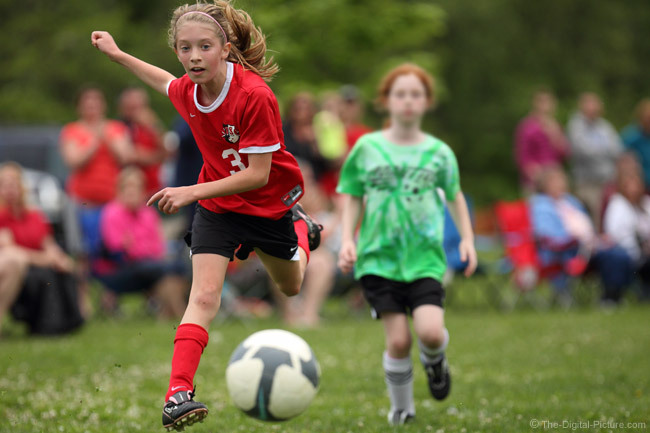 Add the telephoto focal lengths mean sports are a primary target for the 120-300 OS. Another popular subject for this lens, especially with APS-C (1.6x) bodies, is wildlife. The 120-300mm focal length range also makes this lens a very capable indoor event and portrait lens, but the weight of this lens will challenge significant handholding durations. most are going to be happier using this lens mounted to a monopod or tripod when shooting events - and these supports can limit event and portrait shooting flexibility. If you do chose to handhold this lens, OS (Optical Stabilization) comes to the rescue. The Sigma 120-300mm f/2.8 EX DG OS HSM Lens is an upgrade/replacement for the Sigma 120-300mm f/2.8 EX DG HSM Lens and OS is one of the major upgrades that come with it. The 120-300's OS is well behaved (viewfinder image remains steady during OS startup) and features mode 1 (normal) and mode 2 (panning) options. Sigma claims 4 stops of handholdability from this implementation of OS. At 120mm, I can get good handheld results down to 1/13 and 1/10 second exposures - representing approximately 3.5 stops of improvement for me. A few sharp 120mm images were captured at exposures as long as 1/6 second. Longer focal length lenses typically require shorter exposures/faster shutter speeds to deliver sharp handheld results than their wider angle counterparts do. The narrower angle of view means that subject details will cross more sensor pixels with the same amount of movement as when using a wider angle lens. At 300mm, the 120-300 gives me good handheld results down to 1/25 and 1/20 seconds with a few sharp images being made at exposures as long as 1/13 second. This is about a 3.5 stop or slightly better improvement over non-OS results. Following is a 300mm 1/13 second exposure comparison. 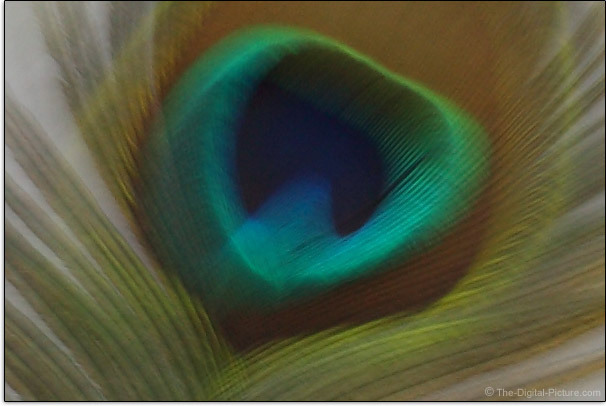 There is no question that this lens can be handheld - at least by relatively strong photographers. And though the 120-300 is heavier than Canon's current 300mm f/2.8 prime lens, the Canon EF 300mm f/2.8 L IS II USM Lens, it is not *that* much heavier. The Sigma of course retains the strong zoom range advantage. High end zoom lenses do not typically perform as well optically as high end prime lenses - such as the Canon 300mm f/2.8 L IS II Lens I just mentioned. How big the difference is is the question that needs to be answered. The Sigma 120-300mm f/2.8 EX DG OS HSM Lens is reasonably sharp wide open with an even degradation outward through the image circle. Full frame corners are moderately soft. The sharpness delivered remains similar throughout the focal length range. Stopping down to f/4 shows nice improvement in sharpness across the full image circle. Stopping down to f/5.6 shows additional nice improvement in sharpness the mid and outer portions of the image circle. The middle focal lengths will see only a small amount of improvement in the mid and outer image circle by narrowing the aperture from f/5.6 to f/8. APS-C body owners will not be concerned with the outer portion of the image circle of a full frame lens. The Sigma 120-300 OS is considerably sharper than the original Sigma 120-300mm f/2.8 EX DG HSM Lens at wider apertures. And if you are buying this lens, f/2.8 will likely be your most-important and most-used aperture. 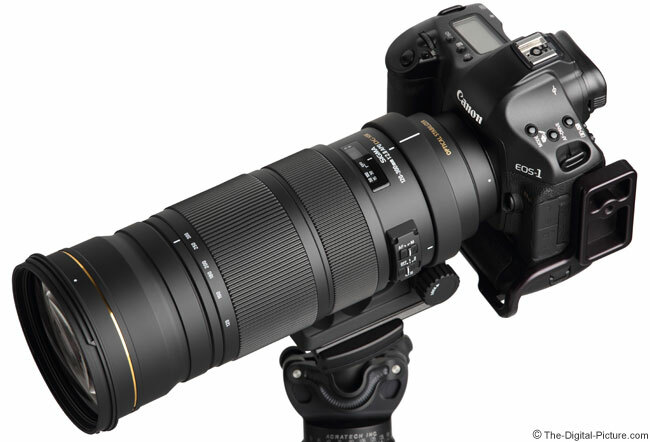 The much more expensive Canon EF 300mm f/2.8 L IS II Lens compares very favorably to the Sigma. The phenomenal Canon EF 70-200mm f/2.8 L IS II Lens also handily bests the Sigma 120-300 in image quality. Of course, neither of these lenses have the Sigma's 120-300mm range in the f/2.8 aperture. As you can see by changing the settings in the 70-200 IS II comparison, the Canon has better image quality at 280mm with an extender attached - but is only an f/4 lens at this focal length. You also may think "280mm is not 300mm". This would be a good time to mention that specified focal lengths are not always exact - especially on zoom lenses. The Canon 300 f/2.8 IS II frames a just-under 4' wide target at 33.19' while the Sigma 120-300 OS must be moved 2.3' closer (to 30.89') for the same target framing. The Canon 70-200 IS II frames the same target at 29.75' at 280mm (w/ 1.4x) - just 1.14' closer. Basically, the difference between the focal length of these lenses is not very significant. Vignetting becomes noticeable when about 1 stop or more of corner shading is present. APS-C (1.6x FOVCF) DSLR users will not likely notice any vignetting from the Sigma 120-300 OS. Full frame DSLR users will see corner shading ranging from about 1.4 stops at 120mm up to just over 2 stops at 300mm. By comparison, the Canon 300 f/2.8 IS II has about 1.4 stops of shading in full frame corners. The Canon 70-200 IS II has about .3 stops more shading in the corners at 200mm and similar amounts at 120mm. The Sigma 120-300 OS shows only a minor amount of CA (Chromatic Aberration) at the ends of the focal length range at f/2.8. By f/5.6, most of this CA has cleared up. As expected from a prime lens, the Canon 300 f/2.8 IS II Lens better-avoids CA. The Canon 70-200 IS II Lens also performs modestly better in this regard. Being a relatively long focal length zoom, the Sigma 120-300mm f/2.8 EX DG OS HSM Lens comes out of the blocks disadvantaged in the flare category. 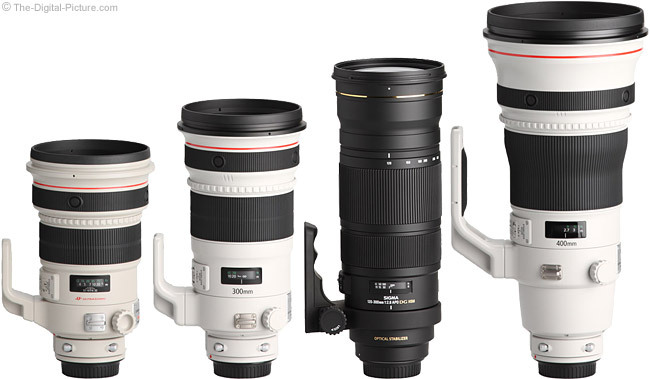 The 120-300 OS adds 5 lenses and 2 groups to the previous 120-300 non-OS lens' count for a total of 23 lenses in 18 groups. Few lenses have more lens elements or groups, though the Canon EF 70-200mm f/2.8 L IS II USM Lens has 23/19 and the Nikon 200-400mm VR Lenses have 24/17. The long focal lengths and large lens/groups count allows this lens to deliver some of the prettiest flare test examples I've seen to date. You will want to keep strong lights out of the frame when this lens is mounted. The Canon 70-200 IS II Lens handles flare better, but I'm not sure about the Canon 300 f/2.8 IS II Lens - it delivers a more-blown-out look in my standard flare test. The Sigma 120-300 OS is nearly distortion free at 120mm. Increasing the focal length imparts an increasing amount of pincushion distortion (normal for a zoom lens) that becomes strongest - but not strong - at 300mm. The Canon 70-200 IS II Lens nearly mirrors the Sigma's performance. As expected from a prime, the Canon 300 f/2.8 IS II Lens is nearly distortion-free. As reviewed above, the 120-300 OS can deliver a strong background blur and the quality of that blur (termed "bokeh") appears to be good. With 9 aperture blades, this lens will create 18 point stars from OOF (Out of Focus) specular highlights when stopped down. It doesn't matter how well a lens performs optically if the shot is out of focus. The Sigma 120-300mm f/2.8 EX DG OS HSM Lens features Sigma's best-available-at-review-time HSM-driven AF system. The lens focuses with acceptable speed and quietly, with only some clicking-type sounds of focusing system movement inside the lens. In the accuracy department, based on my not-so-good experience with the 120-300 non-OS lens, my expectations were not real high. I'm happy to report that this lens performed much better for me than the older lens did. The 120-300 OS front-focuses very slightly on my 5D III, but this was a mostly-consistent focus error that could be resolved through AFMA (AF Micro Adjustment). Most of my One Shot AF results were properly focused. AI Servo is where the AF challenge really begins for a camera and lens combination. I shot several track meets and many soccer matches with the 120-300 OS mounted to a Canon EOS 5D Mark III and had an overall positive experience with the lens' AF. My experienced AF accuracy/hit rate was not as high as with the big Canon lenses, but the Sigma 120-300 OS could keep up with even the men's 100m action at the finish line from a close distance. The lens delivered many good shots for me. 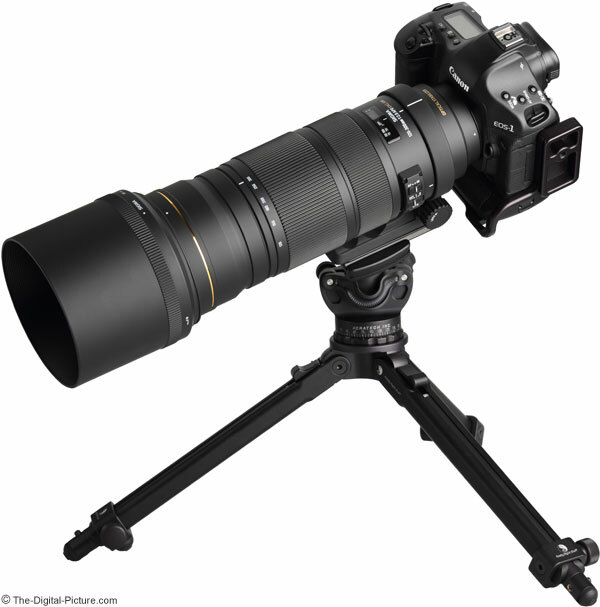 The Sigma 120-300 OS focuses internally and FTM (Full Time Manual) focusing is available. No focus range limit switch is available. The front element does not rotate. This lens is not parfocal. Though distant focusing remains similar across the focal length range, a short distance subject will become significantly out of focus when focal lengths are changed. The Sigma 120-300mm f/2.8 EX DG OS HSM Lens' focus ring is very nicely-sized, very smooth and well-damped - a firm pressure is required to affect change. Videographers will be happy with the lack of focus breathing this lens shows. Subjects remain essentially the same size as they go in and out of focus. As expected from a quality lens, the image remains very stable during manual focusing. The 120-300mm OS does not win any medals for its MFD (Minimum Focus Distance) or MM (Maximum Magnification) values, but neither do most lenses in this class. 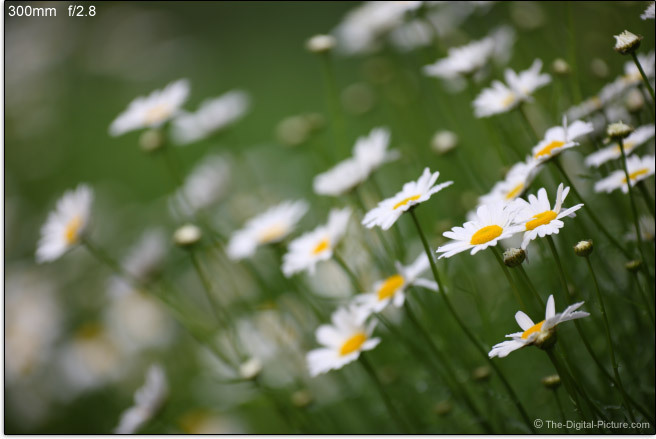 The 300mm daisy samples shown above were shot at near-300mm-MFD for this lens. As usual, Extension Tubes can improve these numbers - but not dramatically so. Mounting an extender behind the Sigma 120-300 OS will make a much bigger difference in the MM values. The Sigma 120-300mm f/2.8 EX DG OS HSM Lens is compatible with the Sigma 1.4x EX DG Tele Converter and Sigma 2x EX DG Tele Converter which result in a 1.4x and 2x increase in both focal length range and MM values. MFD remains the same - and OS continues to work. As expected, image quality takes a hit with the extenders in place. The 1.4x reduces image sharpness and noticeably increases CA. Stopping down the aperture helps. The 2x degrades sharpness even more, but CA does not take an additional hit. F/8 or f/11 produces the best results with this combination. The ISO 12233 resolution chart sample crops will show this clearly (use the link at the top of this review). The Sigma 120-300 OS is a very well-constructed lens. It feels very solid (this feeling is of course helped by its weight) with no play in any parts. Sigma's new smooth finish both feels and looks great - especially great is that it does not collect dust and fingerprints like the old finish did. I also think it will hold up better than the old matte finish - being less likely to peel. This is a fixed-physical-length lens - it does not extend with focal length change (a great feature). As with the focus ring, the Sigma 120-300 OS' zoom ring is very nicely-sized, is very smooth over the entire range and is well-damped with a firm pressure required to affect change. Perhaps too firm at times - it requires counter-resistance on the camera to keep the frame level. Applying just the right amount of counter-resistance is especially important when tracking action. I generally prefer the focus ring to be located behind the focus ring, but in this case, the forward zoom ring position provides a better balance point for the lens. The tripod ring is included and removable. Removal requires un-mounting the lens from the camera, but no hinge is needed on the ring. While the tripod ring is nicely constructed, it is not very smooth in use - and I would go as far as calling it "binding" at times. My Sigma 120-300mm f/2.8 EX DG OS HSM review Lens even developed a squeak at a soccer game I was shooting. This (non-weather-sealed) lens was not subject to any harsh conditions such as dust or rain. No detents are provided at 90 degree rotation settings, but I grew less sure about this being a negative attribute as rotation through these points is smoother without the detents. I could simply tip the monopod to follow the action during a frame burst. A real problem is the shallow depth the tripod ring has. In one of my first uses of this lens on a monopod, I quickly rotated the tripod ring from horizontal to vertical orientation. My left hand was holding the top of the monopod head and the tripod ring's foot. What I learned was that the AF/MF and OS switch housing does not clear my fingers - leaving a bruise on my index finger. The positive aspect of the shallow tripod ring foot is the compact overall width of the lens. This is a relatively large lens for a single-screw-attached lens plate. If using lens plates, make sure that the plate model you select has anti-rotation features. I used the Wimberley P30 Lens Plate on this lens (shown above). For many more comparisons, review the complete Sigma 120-300mm f/2.8 EX DG OS HSM Lens Specifications using the site's Lens Spec tool. The Sigma 120-300 f/2.8 OS is not huge, but as I discussed earlier in the review, this is a heavy lens. It gains 12.3 oz (350g) in weight and .55 x .81" (14 x 20mm) in size over the prior non-OS version of this lens. You can handhold it, but doing so is not comfortable - and holding steady becomes increasingly challenging over a relatively short time period. The Sigma is longer, but the Canons consume more volume - especially with their hoods attached. 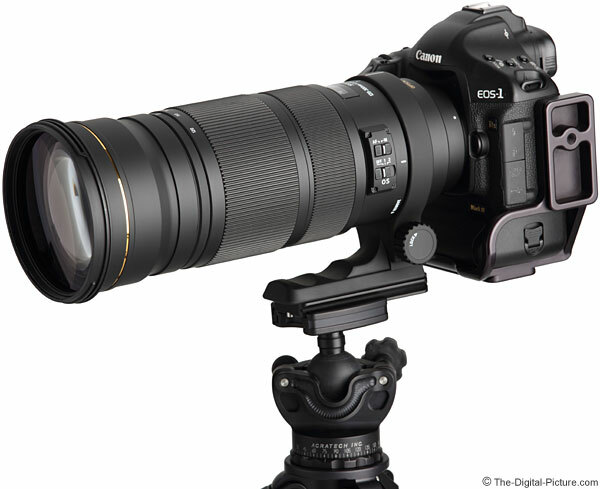 The Sigma 120-300 OS comes with a moderately-large, bayonet-mount, round lens hood. While I can't recommend doing so, the round lens hood nicely supports the camera and lens sitting upright on it. This is nice for relieving your arms while shooting handheld. The hood is adequately sized for installing and removing the center-and-side-pinch lens cap with the hood in place. You will likely want to remove the hood when adjusting a circular polarizer filter. The 120-300 OS utilizes a tradional style plastic lens cap. This is a change from the padded lens hood cover the 120-300 non-OS lens used. Unlike Canon's big guns that accept drop-in filters, the Sigma 120-300 OS accepts front filters. The 105mm filters are huge and quality versions are going to set you back at checkout, but having the option is a positive feature. The Canon drop-in filters are at least as expensive. I mentioned earlier in this review that the front element does not rotate. 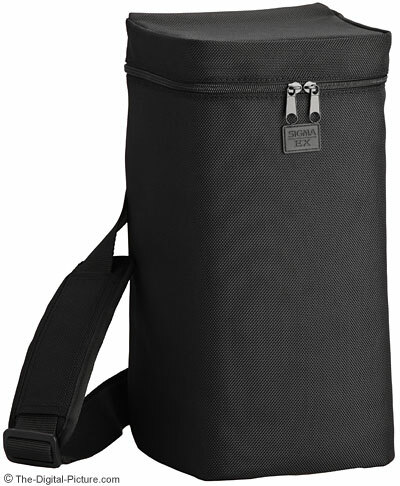 The Sigma 120-300 OS Lens ships with a zippered padded nylon case with a shoulder strap. While nice, the case would be much more functional with a few additional inches of length - enough to allow a mounted DSLR to fit. The Sigma 120-300mm f/2.8 EX DG OS HSM Lens is available in Canon (reviewed), Nikon, Pentax, and Sigma mounts. My standard disclaimer: There are some potential issues with third party lenses. Since Sigma reverse engineers (vs. licenses) manufacturer AF routines, there is always the possibility that a DSLR body might not support a (likely older) third party lens. Sometimes a lens can be made compatible by the manufacturer, sometimes not. There is also the risk of a problem that results in the lens and body manufacturers directing blame at each other. Sigma USA's 4-year warranty is far superior to Canon's standard 1 year warranty (Sigma's international warranty is also 1 year). I've been comparing the Sigma 120-300 OS with the Canon 70-200 f/2.8 L IS II USM Lens and the Canon EF 300mm f/2.8 L IS II USM Lens most directly throughout this review. 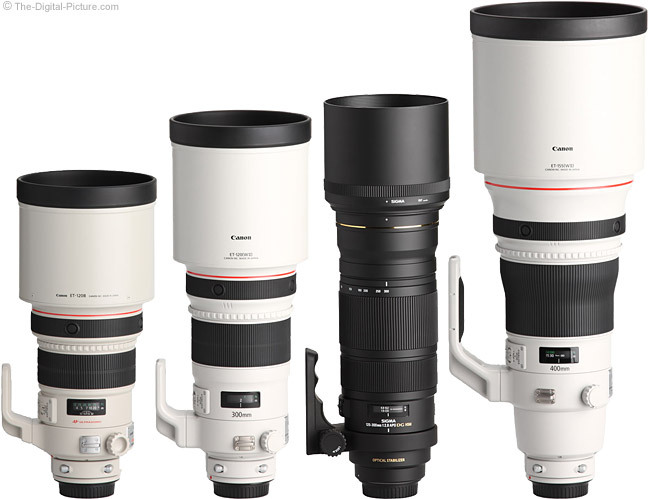 These are Canon's most-similar models from a feature perspective. The two Canons cover the Sigma's focal overall length range (though the pair leave a 201-299mm gap), have a fixed f/2.8 max aperture and have image stabilization. I give the image quality and overall AF performance advantage to the Canons and the focal length range convenience to the Sigma. The Sigma has one more advantage that I have not yet mentioned. While the Canon 70-200 II is less expensive, you could easily buy two Sigma 120-300 OS Lenses (and another nice lens) for the price of one Canon 300 IS II. This fact will be sure to garner the attention of many. The reviewed Sigma 120-300mm f/2.8 EX DG OS HSM Lens was loaned to me (upon my request) by Sigma USA. Unfortunately, I had to return it.